The Cleveland Cavaliers dropped their fifth straight game after getting thwacked by the Sacramento Kings last night. It was their ninth loss in the last 11 games, and the team is now 1-8 in games in which they do not have the services of LeBron James. The Cavs weren't that great even before LeBron James got injured, but they are a damn disaster without him. "This is a team in disarray," the scout said. "They are so discombobulated out there with their new pieces. And it's not just that, there were guys not even crossing half court to get back on transition D."
When a team that sports two young all-stars is getting described as "discombobulated" and "in disarray," there are issues to be addressed that go beyond needing more ball movement and playing better pick-and-roll defense. LeBron can fix a lot of things, but even his return shouldn't leave Cavs fans feeling too confident about their team's title hopes. LeBron hasn't looked very LeBron-ish so far this season, and he's already played more minutes before his 30th birthday than any other player in history. 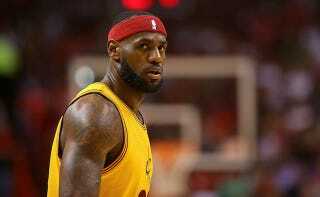 Even in his younger years, LeBron had a hard time keeping up his one-man world-destroyer routine throughout the entire regular season and playoffs, an issue that was supposed to be circumnavigated by the addition of Love and Irving. But the way the Cavs look right now, they are going to need their star to return to his godlike status in order to stand a chance in the playoffs. They better hope this isn't the season when that finally becomes too much to ask of him.